Graduate students in the Environmental Science and Natural Resource Journalism program used several social media platforms for reporting live coverage of Vandana Shiva’s lectures at the University of Montana last week. By reporting live, via Twitter, Instagram and Periscope, the grad students tried to engage with a broader audience and instigate a conversation with people who weren’t physically present to hear Shiva speak. Prior to Shiva’s talks, to gain journalistic insight on Shiva’s influence, Associate Professor Nadia White had the grad students read a controversial profile on Shiva that the New Yorker published in August 2014 and the consequent responses from Shiva, the New Yorker’s editor and outside journalists. Vandana Shiva speaks at the Dennison Theater on Wednesday, February 24th, 2016. Photo by Courtney Gerard. 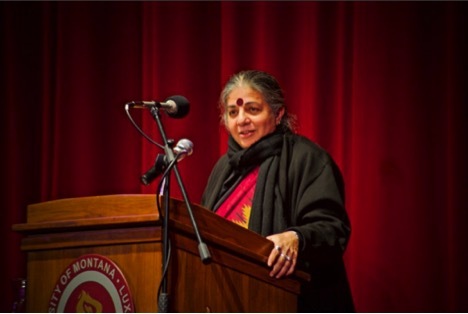 Vandana Shiva, an environmental activist who passionately opposes genetically modified organisms (GMOs), spoke at the University of Montana on Wednesday, February 24th. During the afternoon she led a seminar called “Living Seed, Living Soil, and Earth Democracy”. Then, in the evening Shiva spoke as part of the Brennan Guth Memorial Lecture series, sponsored by both the Environmental Philosophy and Environmental Studies programs. Both presentations were part of the on-going President’s Lecture Series at UM. Shiva’s evening lecture, “We Are All Seeds: Food Security and Environmental Sustainability,” followed the metaphor of humans as seeds, as Shiva spoke about the need to preserve the diversity and health of both physical and metaphorical seeds. Her presentation was met with a packed theater and three standing ovations. More people queued up for the Question & Answer sections than she had time to address. Courtney Gerard also felt quick support from Instagram after posting pictures of Shiva speaking in the Dennison Theater. Gerard also had an eye on the crowd and captured a few people thinking more critically of Shiva’s message. While she snapped pictures of the audience and Shiva from center stage, Gerard left her tape recorder running so she could accurately quote the lecture in further stories. Benjamin Alva Polley noted Shiva’s efforts to make a connection with UM community members. Polley tweeted Shiva’s opinion, “Campuses are not just about education anymore, but about life.” At the evening lecture, a researcher at UM asked Shiva what she would tell academics researching GMOs and furthermore, what evidence would she need to change her absolutist stance against GMOs. During one example, Shiva cited the rates of autism prevalence in the United States as 1 in 35 people and faulted BT toxins and GMOs in gut bacteria. She predicted that ratio would rise to 1 in 2 in the next hundred years. However, current autism research reflects a ratio of 1 in 68, and to understand autism’s role in the brain, current research focuses more on the neurological and genetic causes. Additionally, autism experts think that the recent rise in both awareness and diagnoses programs also contribute to the rising rates of people who experience autism spectrum disorder (ASD), so Shiva’s prediction reflects more on scare-tactics than scientific fact. Coming from a journalist perspective, the main challenge came not from any controversial opinions about GMOs or Shiva’s personal beliefs, but from the lack of her ability to answer the basic and specific “who, what, where, when, why and how” questions. The next event in the Presidential Lecture Series, will take place on Monday, March 21st and feature Roald Hoffmann, who won the Nobel Prize in Chemistry in 1981.